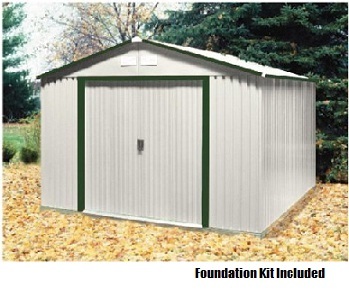 Free shipping for this 50512 metal utility building shed when shipped to the lower 48 states. Increase your storage space with this attractive metal shed.? Foundation kit included.? The duramax sheds are heavy and high quality. A great way to store your tools, garden supplies, lawn mower or firewood. Thick industry standard walls - Metal Frame thickness .019", wall panels .0088", door panels .0141"
Thick groove steel walls to decrease denting Metal frames are .019, wall panels are .0088 and the door panels are .0141. Measurements are of one inch. Please note that these shipments are too large for fedex and ups and require freight delivery on a semi-truck. The freight company will call you to set up a delivery. Someone will need to be home to sign for it. The freight company will unload it for you curbside. Competitive Edge Products, Inc. is an authorized distributor of Duramax 50512 storage garages.